Double-clicking a relationship on the EER diagram canvas opens the relationship editor. This has two tabs: Relationship, and Foreign Key. In the Relationship tab, you can set the caption of a relationship using the Caption field. This name displays on the canvas and is also the name used for the constraint itself. The default value for this name is fk_source_table_destination_table. Use the Model menu, Menu Options menu item to set a project-specific default name for foreign keys. To change the global default, see Section 3.2.4, “Modeling Preferences”. You can also add a secondary caption and a caption to a relationship. The Visibility Settings section is used to determine how the relationship is displayed on the EER Diagram canvas. Fully Visible is the default but you can also choose to hide relationship lines or to use split lines. The split line style is shown in the following figure. A broken line connector indicates a non-identifying relationship. The split line style can be used with either an identifying relationship or a non-identifying relationship. It is used for display purposes only and does not indicate anything about the nature of a relationship. To set the notation of a relationship use the Model menu, Relationship Notation menu item. For more information, see Section 9.1.1.1.5.4, “The Relationship Notation Submenu”. 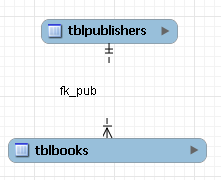 The Foreign Key tab contains several sections: Referencing Table, Cardinality and Referenced Table. The Mandatory check boxes are used to select whether the referencing table and the referenced table are mandatory. By default, both of these constraints are true (indicated by the check boxes being checked). The Cardinality section has a set of radio buttons that enable you to choose whether the relationship is one-to-one or one-to-many. There is also a check box that enables you to specify whether the relationship is an identifying relationship.